T.S. Eliot had measured his life out with coffee spoons. Some claim coffee is the most valuable trading commodity after oil. Ordering coffee in Australia is a different sport compared to any other country. Sure, there are still standards, e.g., cappuccinos, lattes, mochas and macchiatos. What is idiosyncratic for New Zealand and Australia is my favourite, the “flat white”. If you dig what is elsewhere referred to as Americano, down under you would need to ask for a “short / long black” to not be disappointed. Double and single shot servings are different depending on the coffee dispensary you frequent. The only constant is that flat whites demand double shots, whereas lattes and cappuccinos get single shots. American double tall skinny latte orders translate to “large skinny latte double shot” where the sun shine. The barista might take it upon themselves to correct your order to a doppio or may say that all their coffees are a double shot. Local cafes roasting their own coffee and distributing it are popping up like mushrooms. Since 2002 DC has been committed to roasting specialty coffee. Based in Melbourne, where their manufacturing infrastructure is located, they have been servicing the Sydney and Adelaide markets since day one. B-side tracks are always the unknown gems in on an artist’s album record. They are those certain songs separate from the main album that live a life of their own; perhaps a remix of a classic, a live performance, an instrumental or even a spoken word. Whatever it is, the B-side always showcases raw artistic creativity without constraints and reveals something more about the artist. Paying homage to this, dc’s B-Side delivers a unique blend created by our roasters for themselves. The dc blend we sampled is named “B-side” not only to signify the alternative ‘track’ to 100% Arabica coffee, furthermore it signifies dc’s endeavours to support and give emerging talent a leg up. DC’s Reale comes with an aroma reminiscent of fruit and herbs, light-medium body and low acidity, it harbours flavours of sweet caramel, honey and nutty flavours, culminating in an aftertaste of citrus. 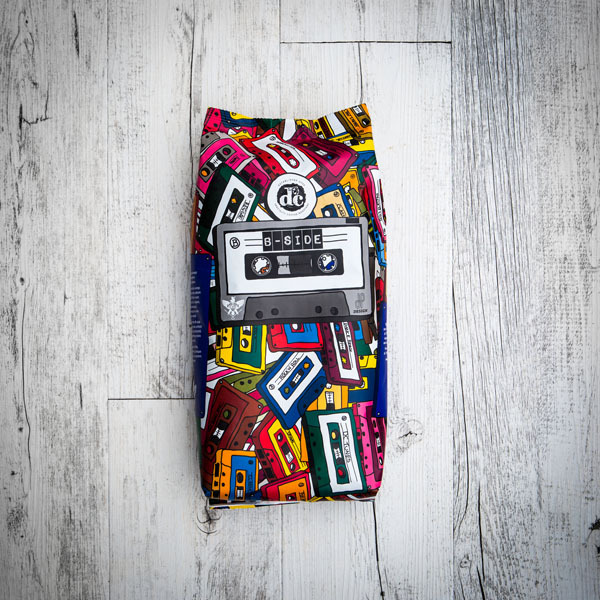 The packaging of Reale features artwork of artist Sindy Sinn. His design for Ducale’s ‘Reale’ blend came about fairly naturally. He liked the idea of ‘keeping it reale’ and giving it some underdog fighting-spirit. So he just treated the Reale design like it was a gang, rooted in his fascination for the movie The Warriors. DC’s Monsoon is a mellow tasting coffee with a sweet fragrance. Featured artist for Monsoon is Thomas Townend, a Sydney based artist working mainly with acrylic inks on paper. His work is inspired by tattoo flash and all things tattoo related although recently getting inspired from early eastern art. More into industrial strength coffee with a solid flavour? 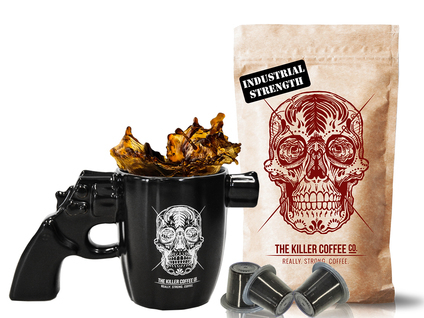 Killer Coffee Co is on a mission to redefine what it means to drink strong coffee. The post blended, small batch Killer Coffee is like an energy drink on steroids in coffee form. We are talking a 100% Arabica whole beans. Despite the undeniable impact, it is actually quite balanced and smooth, something that might be expected from the strongest cup of coffee going around. How about we make your hot beverage golden? 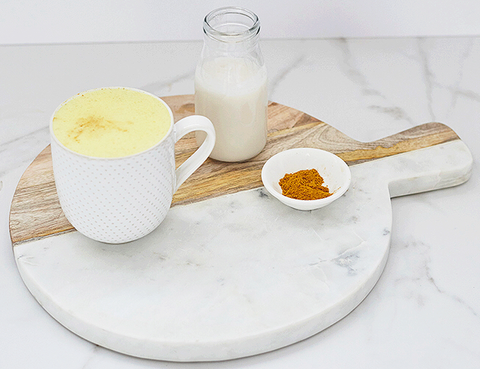 Turmeric lattes are fast becoming the favoured morning pick-me-up for health aficionados and whilst it might not replace chocolate, it is an adequate replacement for that post-lunch sugar craving. Turmeric Midas Cup comes with anti-inflammatory and immune boosting goodness, i.e. it is good for your gut bacteria and your hayfever - all that needs to be done is adding a teaspoon of gold to some hot milk and sip sip sip. Midas Cup was born when nutritionist / food scientist Samantha Holdsworth, who was already obsessed with the benefits of turmeric, introduced her OCD stylist / ex-marketer friend, Elaine Marshall, to what is commonly known as “golden latte”. After complaining about spending many hours and dollars searching Melbourne for the perfect golden latte, Holdsworth suggested that Marshall make her own. After realising the merits of their own blend, they decided to share their Midas Cup magic with the world. Midas Cup is free from preservatives and pesticides, contains no traces of nuts, dairy or soy as well as being sugar and caffeine free. All ingredients are 100% Australian Certified Organic from an organic supplier in NSW - raw, vegan and yummy with no downsides. Like the pause that tea allows? have launched their very own ‘literary’ organic tea called ‘poet,’ which can be found at their bookshop and tea atelier ‘poet store’ in Bangalow, where the book selection is curated by the editors of Womankind magazine and New Philosopher magazine. They have a carefully selected range of ten certified organic fair trade teas – from the hills of Sri Lanka ranging from Ode Oolong to Poet’s White with Orange. Poet’s award-winning organic Earl Grey and English Breakfast teas are smooth, strong and fresh, the Green Tea crisp and light or alternatively mixed with rose petals, the Chai comes as a fine blend with spicy undertones and Poet’s Chamomile is one smooth and soothing companion that can be counted on. 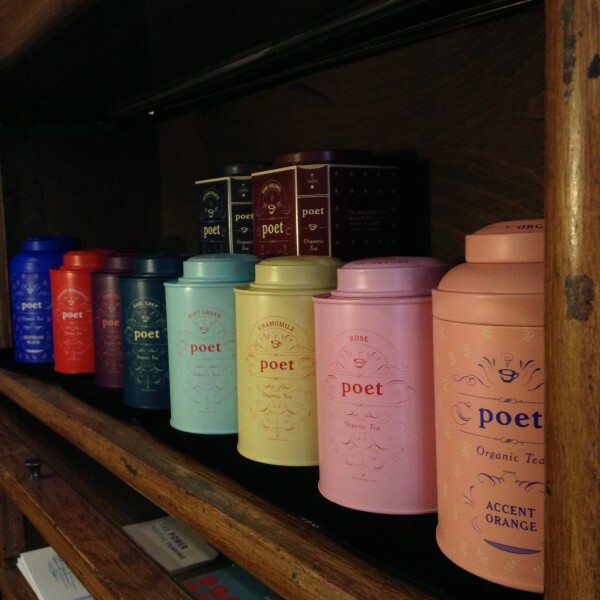 All of Poet’s teas from in beautifully designed tins from the team behind New Philosopher magazine. Photos from websites of companies discussed above.